Boldione is the precursor to boldenone, and as of January 4, 2010 is a Schedule III Controlled Substance. In 2004 the United States Congress passed the Anabolic Steroid Control Act of 2005 which placed 36 steroids and over the counter pro-hormones into schedule III of the Controlled Substances Act. In this legislation boldenone was classified as a controlled substance and boldione remained legal. In April 2008 the United States Drug Enforcement Administration published an "Initial Notice of Proposed Rulemaking" concerning the scheduling of three anabolic substances: boldione, desoxymethyltestosterone, and dienedione. In 2008, at the time of the proposal, these three substances were listed as ingredients in more than 58 dietary supplements which were available for purchase over the counter. Effective January 4, 2010 these three chemicals, including boldione, were classified as Schedule III Controlled Substances and became illegal in the United States. 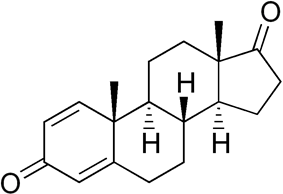 Note: 21-Hydroxylase inhibitors may also affect androgen levels as they prevent metabolism of androgen precursors.